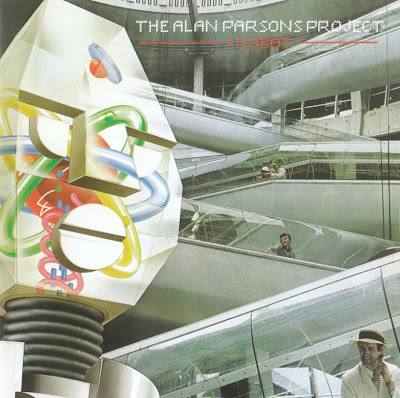 I Robot is a progressive rock album recorded by The Alan Parsons Project, engineered by Alan Parsons and Eric Woolfson in 1977. It was released by Arista Records in 1977 and re-released on CD in 1984 and 2007. It was intended to be based on the I, Robot stories written by Isaac Asimov, and actually Woolfson spoke with Asimov, who was enthusiastic about that. As the rights had already been granted to a TV/movie company, the album's title was altered slightly by removing the comma, and the theme and lyrics were made to be more generically about robots rather than specific to the Asimov universe. The cover inlay reads: "I ROBOT... THE STORY OF THE RISE OF THE MACHINE AND THE DECLINE OF MAN, WHICH PARADOXICALLY COINCIDED WITH HIS DISCOVERY OF THE WHEEL... AND A WARNING THAT HIS BRIEF DOMINANCE OF THIS PLANET WILL PROBABLY END, BECAUSE MAN TRIED TO CREATE ROBOT IN HIS OWN IMAGE." The title of the final track, "Genesis Ch.1 v.32", follows this theme by implying a continuation to the story of Creation, since the first chapter of Genesis only has 31 verses. The track "Don't Let it Show" was later covered by Pat Benatar on her album In the Heat of the Night.